If you need custom calendar printing, either for corporate gifts for your business customers or personal use, The UPS Store can help. Make your own personalized calendar and keep your business front of mind by integrating your company logo, branding and important business dates. We can print your calendar in full-colour or black and white, as a single page or multiple pages finished with coil or comb binding. If you want to make your promotional calendar really stand out, try including photographs or graphics. Photo calendar printing is a great way to advertise your business and say thank you to loyal customers. Just tell us your design ideas and The UPS Store will bring them to life! Drop into your local The UPS Store to start planning your print run today! Or, enjoy the convenience of ordering and printing your personalized calendars online with The UPS Store Online Printing. 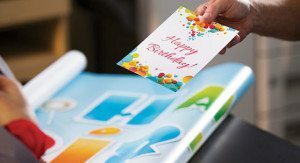 Most The UPS Store locations offer online printing and some even have an experienced graphic designer on staff to assist with the design of your print job. Simply contact your nearest store to find out which custom calendar printing services are available.